Once again, one of my favorite sites for music theory tools has done it again. This time Ricci Adams site MusicTheory.net has created a guitar fretboard trainer that is different than any other I've seen. This Fret Trainer allow you to begin with as many frets as you are comfortable with. You can start with just 1 or adjust up to 12 frets. Also the tool lets you choose both the flat and sharp names for the pitches in instances where a pitch contains an accidental. The tool will also keep score as you progress and allow you to print a progress report, which is useful for teachers that want to assign this as a practice method or homework assignment. If you struggling to learn your guitar frets this adjustable tool may be just the thing you are looking for. Learning the notes of scales and chords can be a laborious process and often times students need a good resource for checking the accuracy of them. Although you can learn how to construct chords and scales from memory there is an absolutely amazing tool for finding scales and chords on just about any fretted instrument, including guitars, basses, and mandolins. This tool is the Chord and Scale Fret Finder tool from StudyBass.com. What is also great about this tool is the ability to use alternate tunings such as open C and D.
Check out the print feature as well so you can play your scales and chord offline, or keep in your instrument case for quick reference. In this guest by post by Dan Vuksanovich, from WhyISuckAtGuitar.com, we will explore the guitar fretboard. The guitar fretboard can be a bit confusing for beginners, or even for people who have played other instruments, such as the piano, where there’s only one place to play each note, but the layout is actually very simple. In standard tuning, the strings (from lowest sounding to highest sounding) are tuned to the pitches E, A, D, G, B, E. These strings are sometimes called by number, starting from the highest pitch string and ending with the lowest pitch string (e.g. the “fourth” string would be the string that plays the open D) or by note name (e.g. the “D” string). Each fret represents one minor second, or half step. 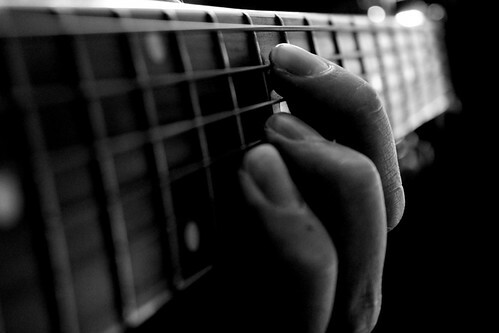 An open string does not count as a fret. It is simply referred to as an open string. With the exception of the G and B strings, the interval between each open string is a perfect fourth. The G and B strings are separated by a major third. This is done as a compromise to make chording and scales both relatively easy on the instrument. If the guitar were tuned in all perfect fourths, many of the barre chords used in standard tuning would not be possible. At the twelfth fret, the entire fretboard pattern repeats itself. The open notes at the twelfth fret are one octave higher than their respective open strings. This makes sense because the chromatic scale has twelve tones, and each fret represents one step in the chromatic scale. Dan Vuksanovich received his Master of Music degree in classical guitar performance from the Peabody Conservatory of The Johns Hopkins University in 1999. He currently teaches and blogs about how to get better at guitar via his website www.whyisuckatguitar.com.